Luciferina Review: Beautiful, unique, uneven, and familiar – AiPT! 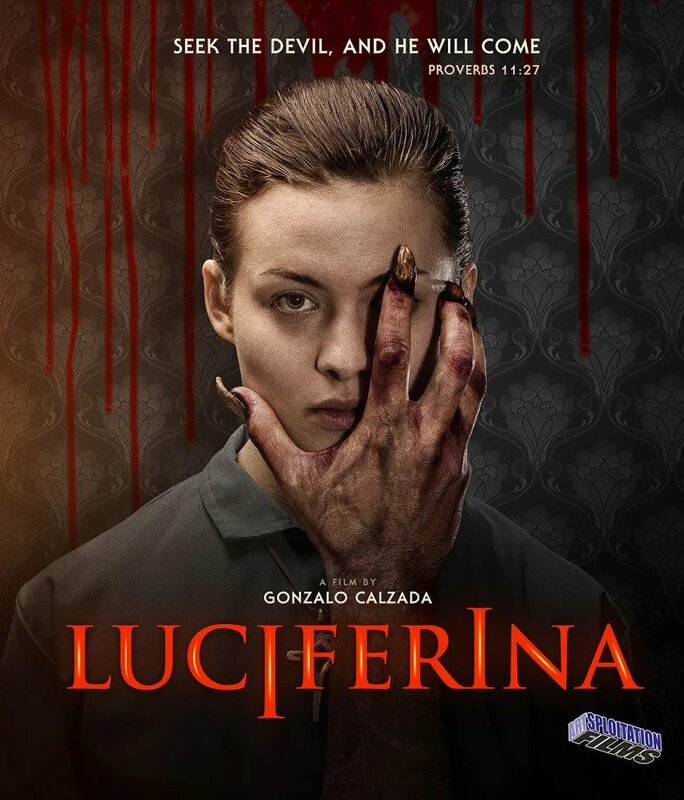 Luciferina is not a standard horror movie. Luciferina sounds like your typical horror movie. An innocent girl and her rebellious sister (Natalia is a nun and her sister Angela wears all black) meet at home after their father falls gravely ill. There is a deep voice that speaks Latin, a shower scene showing Natalia may not be as innocent as others think and the plot involves a group of friends travelling to an abandoned church. It may check off many of the boxes, however Luciferina is not a standard horror movie. Tone and atmosphere are very important in any horror story. One of the ways to set an appropriate mood is through camera work. Luciferina is filled with beautiful shots. In particular, director Gonzalo Calzada does some amazing work with outdoors shots. Trees and buildings are framed perfectly in many establishing shots. By far, the movie’s best looking sequence is during the finale. The scene is stunning and transcends what audiences have been taught to expect. The moment is deceptively simplistic as there are only two characters and little scenery, but the emotions displayed are amazing. The camera work is stunning and highlights the creativity and artistry of Calzada. The use of light and shadow in Luciferina is also excellent. This is most clear during the early dream sequences in the film. The scenes have a washed out look that make it impossible to tell whether it is day or night. This adds to the creepiness of the moments. Luciferina is a horror movie so there are traditional jump scares but many of the scare shots are due to clever placement of camera and actors. Those moments are less forced while the jump scares are more surprising and impactful. This works especially well since the movie does such a great job playing with its audience. Luciferina’s greatest strength may be how it seamlessly weaves reality and fantasy. The audience is never quite sure if what they are seeing is actually happening which leads to greater engagement. This is most noticeable about halfway through the movie. Everything from camera shots to actions seem to alternate in and out of reality. The shocking amount of gore and violence only add to then unreal quality. It is a fascinating and interesting ride. Unfortunately, it is also at this point that Luciferina’s flaws start to show. The first problem is the movie has way too many subplots going on. This leads to a long movie that is oddly paced. Luciferina deals with many themes and the ending certainly leaves the meaning open to interpretation, but it is also a fairly straightforward story. Still, the movie is almost two hours long. It never drags, but it comes dangerously close. This is most evident in a long scene in the middle. The moment is supposed to add more mystery to the situation while also revealing the nature of the evil, but it is long and is almost made immediately pointless in the following scene. It also leads to more questions and plot inconsistencies involving a character and their parents. The first two acts of the movie also seem unnecessarily long since the movie seems to race to its climax. The final battle just sort of happens and the movie seems to end. Luciferina then continues to a beautiful ending that makes sense but also underlines how uneven the film is. The movie goes from anticlimactic to stunningly beautiful in a matter of minuets. It is the type of roller coaster ride you do not want to take your audience on. Luciferina is a frustrating movie. At first, it appears as if it is going to be a standard horror movie that is shot better. It soon becomes clear it may have some tropes, but it is something entirely different. At times it looks mesmerizing and the story it wants to tell has the potential to be a deeply moving one. Regrettably, the writing is not always up to par and the odd pacing prevent it from being something truly special. Beautiful looking with a great story, Luciferina is held back by pacing and writing issues. The final scene alone makes it worth watching, but be prepared.